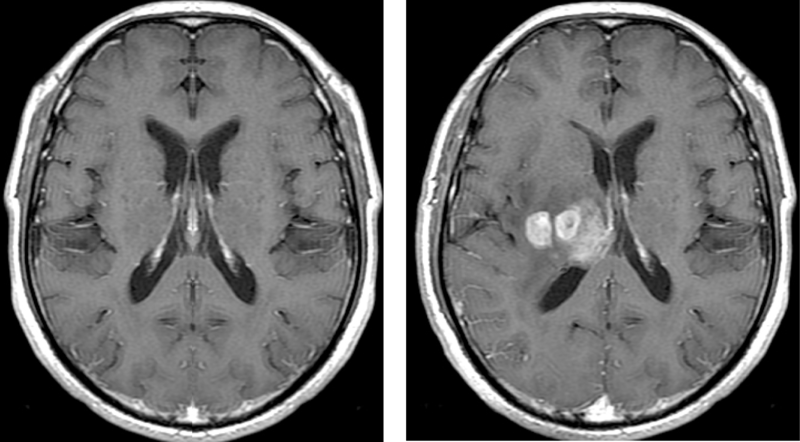 Glioma is the most common type of malignant brain tumors, characterised by an infiltrative growth into the surrounding tissues. The growing tumor compresses the surrounding tissues and nerves leading to brain deformation and an increase in intracranial pressure (see Figure 1.). Patient specific tumor growth modeling could lead to better treatment outcomes, by aiding surgical and radiotherapy planning. Figure 1: Healthy anatomy (left) in comparison with anatomy deformed by growing tumor (right). Figure 2: Cut through brain anatomy reconstructed from MRI scans. For the biophysical modeling of the macroscopic tumor growth processes several models were developed taking into consideration the invasion into surrounding tissues as well as accounting for the induced brain deformations. In order to make accurate patient specific predictions, parameters of the tumor growth model, that vary on a case-by-case basis need to be identified. To infer the most suitable tumor model parameters observations of the tumor evolution from a series of MRI images are used. Given the forward biophysical model of tumor growth, parameters generating the best correspondence between the predicted and observed tumor distributions are identified. To solve the parameter inference problem, a data assimilation approach is pursued, where model parameters are identified in an efficient manner based on PDE constrained optimization. The goal of this thesis project is to develop an efficient solver for glioma growth and brain deformations, and do parameter estimation based on a data assimilation approach. The glioma model shall be implemented using FEniCS?, a flexible high performance FEM modeling environment. For the PDE-constrained optimisation the DOLFIN-ADJOINT extension should be considered. 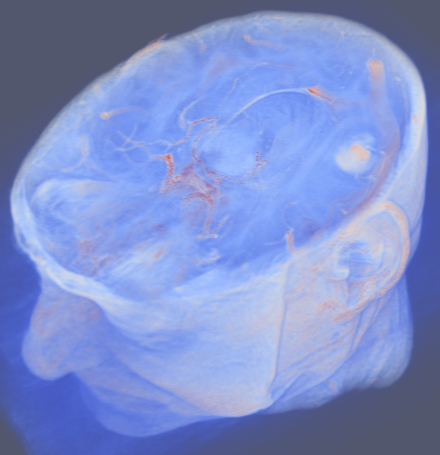 Sophisticated imaging methods and an emergence in computational technologies has enabled the use of complex multiphysical models with the emphasis to provide the best course of treatment taking into consideration the uniqueness of each case. During this project insights into such an application will be obtained, and familiarity with some of the core aspects - individualization of the simulation, model parameter inference - will be gained. We hope that the gained experience will establish competence in this emerging field of research.